This product is a patented product of the unmanned full intelligent express strapping machine independently developed by our company, which is specially designed for e-commerce logistics users. 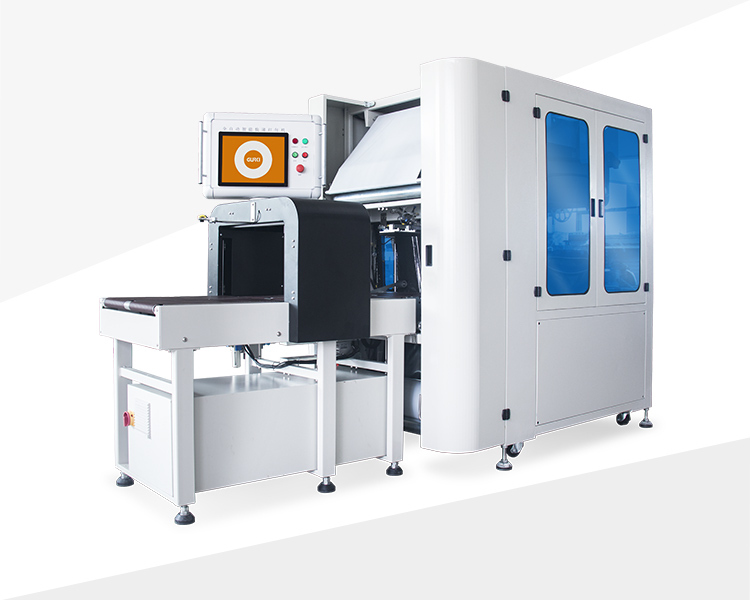 The whole machine is based on high-performance industrial control computer, and provides integrated solutions such as automatic measuring, automatic scanning, automatic weighing, error rejection, sealing film, automatic printing, and automatic pasting express order. At the same time, we can offer the mainstream ERP system and WMS system according to the customers ‘s needs. We provide the overall solution for the shipment of plastic film goods packaging for customers. This is the first full intelligent express strapping machine on the market which is suitable for occasions with large shipments and diverse product specifications. 1. The sealing is firm and the packaging is beautiful According to the characteristics of the express bag, the vertical sealing system is specially designed to ensure the bag is strong. The horizontal sealing knife adopts servo control system with high stability and high speed. This equipment can seal and cut the conventional express film, can adjust the length of the bag adaptively, without manual intervention and use of adhesive tape, helping the company to save 30% of consumables. Full intelligent express strapping machine speed of up to 1200 bags per hour, using servo motor and variable frequency control technology, photoelectric automatic detection, 2D imager automatic scanning, to ensure the precise position of the product, suitable for packaging products of different sizes and shapes. The whole machine is based on high-performance industrial control computer, adopts intelligent servo control technology, can intelligently scan and identify product information, automatically adjust the sealing and cutting position according to the product size, quickly adjust the express bag and labeling position, and realize express automatic packaging. Widely used in products of different sizes and shapes. The equipment can automatically joint the mainstream ERP system, WMS system and the front section sorting line, without manual intervention, realize the product's scan code, weighing, film sealing film, automatic printing surface and paste all the process, truly achieve unmanned operation. This equipment breaks the traditional multi-machine combination design mode, integrating automatic weighing, code scanning, weighing, error rejection, film sealing, automatic printing express order and automatic express order pasting, without manual intervention, scanning adjustment takes only 0.5 second. In order to prevent the occurrence of errors, the express order is automatically generated by the system and automatically printed and pasted without manual intervention. Anti-pinch, anti-scalding, anti-misoperation, safe to use.